3 3/4-inch Dexter Dark Defender Action Figure! 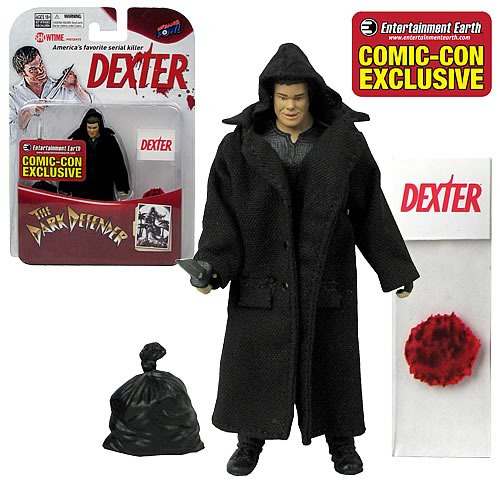 Comic-Con Exclusive figure based on Showtime's hit series Dexter. Limited edition figure features 10 points of articulation! Entertainment Earth Comic-Con Exclusive! Bif Bang Pow! presents the first-ever 3 3/4-inch Dexter action figure based on Showtime's hit series Dexter! This fan-demanded Dark Defender Action Figure is deftly crafted of PVC plastic and features 10 points of articulation and an awesome blood-slide accessory. It's also fully compatible with Entertainment Earth's own line of action figure stands (sold separately). You'll want this good guy / bad guy in your toy box or Dexter collection! Limited edition of 3,000 pieces. In the super-popular Showtime TV series, Dexter is a blood-spatter expert for the Miami Police Department by day that spends his nights going after serial killers and other bad people.